Price: 4G data prices can dig a hole in your pocket, though the packages may look very lucrative. But if compared closely, you will find that the cheapest home broadband packages are generally less costly than the cheapest mobile broadband products. The costs of 4G data packages are comparatively very high. Speed: Though 4G providers claim high internet speed, but the browsing experience using 4G is highly influenced by the number of other people using it at the same time. At the moment, home broad band’s network is fairly empty, so the download speeds and upload speeds are very fast. Moreover, with high speed, high data transfer happens, which ultimately results of quick bandwidth exhaust. Coverage: In India where even now getting a good 3G signal quality is a dream in many parts of the country, getting 4G coverage is mere infancy. It is only available in select parts of the country and from a smattering of providers. Consistency: 4G is not very consistent and it’s certainly more subject to network slowdowns from higher user capacity; as with the increase is user traffic, network slowdowns of mobile networks increase and results in more downtimes. Customer/Technical Support: Even the best connections experience problems, and chances are you will have an issue or problem you need to address or solve. Mostly, for home broadband providers giving technical support to its customers is a priority; whereas, 4G service providers don’t have proper immediate support. Their support goes in a loop of CC emails and it’s a real pain for customers, who need immediate support or help. Field Service: 4G service providers are the big players who already have large number of customers; so their services and support eventually get degraded day by day. If any failure or outage occurs due to any reason, the getting field service from 4G providers is a pain for customers; whereas with home broadband providers one can expect immediate field response. Download Allowance: You’re far less likely to find a 4G mobile broadband deal with an unlimited download allowance. The download limits are much lower for 4G packages. They were never built to carry vast quantities of data. Though it is fine for general Web-browsing needs like emails or facebook, but if you’re heavy internet user, or into online gaming or other bandwidth-intensive activities such as video streaming, film buffs, etc, then this will be a massive non-starter for you and could become very expensive very quickly. 4G can’t replace home broadband as long there are data caps. Most home packages offer unlimited download allowances, but these are much harder to come by for mobile broadband. Bundle Options/Add-ons: Home broadband providers give additional products or services bundled together so that customers can have a great deal; whereas in 4G services there are no such things called extra or additional. Application Accessibility: Some mobile operators might block access to certain applications, such as Skype or WhatsApp, or make users pay a premium to access those applications or services. Reliability: Of course, none of these above features matter if you can’t use the service when you need to. A key measure of performance is the reliability of the connection it provides. Disconnections and dropouts remain problems in 4G networks. Home broadband providers give more reliable service than that of Mobile broadbands. 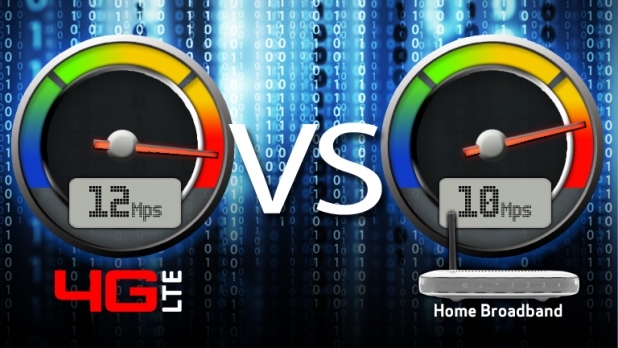 Finally, we can conclude that 4G is not a replacement of broadband at your home. 4G is good to be used for mobiles or smart phones as it is portable, but not a very wise idea to be used as home broadband.